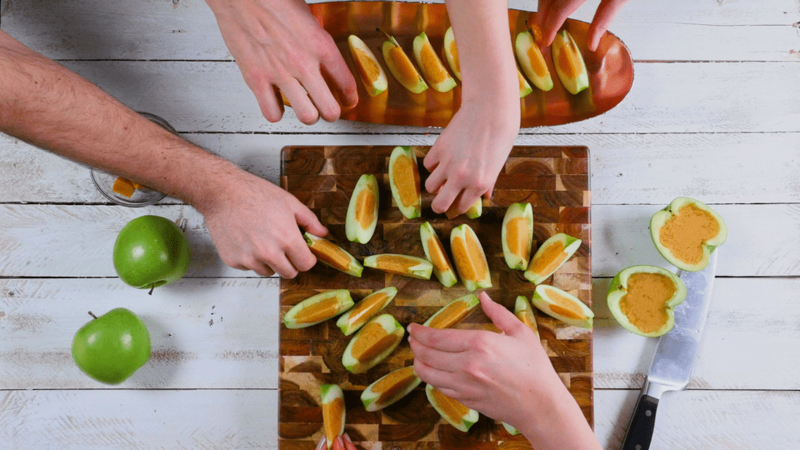 Use real apples to mold these salted caramel jello shots, turning a kids' classic snack into an adorable adults-only treat. You'll need flavored vodka to give this recipe its rich flavor, as well as apple cider for an authentic apple taste. And while these shots firm up in about 4 hours, it's best to make them a day in advance to keep them solid in their apple wedge shape. Cut apples in half, down the stem. Using a paring knife and melon baller hollow out the center being careful not to puncture the skin. Brush the inside and edges of the cup apples thoroughly with lemon juice to prevent browning. Placing them face down will also help. Pour the cider into a small pot or deep pan. Sprinkle both packets of gelatin on top and let it sit for about 2 minutes to ‘bloom’. You’ll see a ripply film form on the top. Place the mixture on low heat. Heat and continually whisk until the gelatin evenly dissolves, about 2-5 minutes. Be careful not to let the mixture come to a boil. Then whisk in the melted caramel. Once everything is evenly combined, remove from the heat and let cool a bit. Add vodka and stir to thoroughly combine. Place the apple halves in a muffin tin, facing up. Pour the mixture into each hollowed-out apple. Refrigerate until firm, 4 to 24 hours. Cut the apple halves carefully into wedges and serve. Can You Handle the Heat of a Prairie Fire?